The ultra-modern OVO Wroclaw complex comprises 50,000 square metres in Wroclaw, Poland’s fifth largest city. Designed by Gottesman-Szmelcman Architecture, with JSK Architekci as executive architects, this statement-making project is located near the historical market square and features an inspiring rounded façade made with Corian® high-tech surface in white colour. The ultra-modern OVO Wroclaw complex comprises 50,000 square metres in Wroclaw, Poland’s fifth largest city. Designed by Gottesman-Szmelcman Architecture, with JSK Architekci as executive architects, this statement-making project is located near the historical market square and features an inspiring rounded façade made with DuPont™ Corian® high-tech surface in white colour. 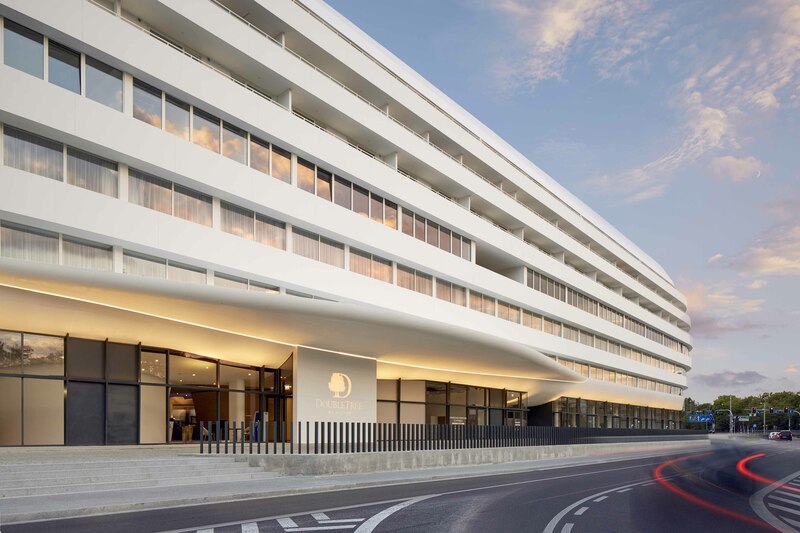 An astonishing 6,000 square metres of sophisticated Corian® wraps around corporate offices, 180 luxury residences and a five-star DoubleTree by Hilton hotel with 189 rooms and suites and offers a majestic view for visitors to its sprawling inner courtyard. This sleek white structure takes its place next to the classical Brick Expressionism post office and is now a part of Wroclaw’s evolving urban landscape. Wroclaw, a business city set on the banks of the Odra River, offers a variety of architecture and is the ideal setting for the OVO Wroclaw to make a significant statement. Gottesman-Szmelcman Architecture’s concept focused on layering the building in such a way that it reflects the complexity and richness of urban life. 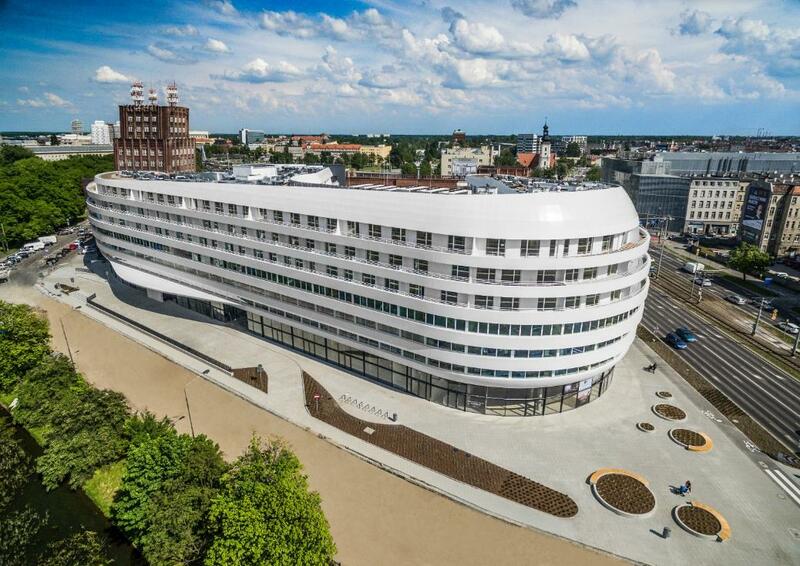 DuPont™ Corian® has been used for exterior cladding for the futuristic OVO Wroclaw centre (Wroclaw, Poland) and is also found in a variety of interiors at the high-end DoubleTree by Hilton Hotel located inside the centre itself. Design by Gottesman-Szmelcman Architecture, www@gsarch.org Photo by Kamil Czaja. DuPont™ Corian® has been used as exterior cladding for the futuristic OVO Wroclaw centre (Wroclaw, Poland) and is found also in a variety of interiors at the high-end DoubleTree by Hilton Hotel located inside the centre. Design by Gottesman-Szmelcman Architecture, www@gsarch.org . Photo by Kamil Czaja. Corian® was also used for making the Doubletree by Hilton backlit logo and in a variety of other interior applications in the hotel, including an elegant welcome area at the reception, backlit signage of individual apartments, bathroom worksurfaces. As the site is highly congested with guests coming and going, it must withstand a great deal of traffic while still maintaining a fresh and clean appearance over a long period of time. That is why Corian® in Glacier White colour – the same that appears on the façade – is a perfect choice as no dirt or bacteria will appear on its surface. Corian® was also used in wall cladding in conference rooms and bathroom countertops, proving how versatile the material can be as a design tool if placed in the right creative hands. DuPont™ Corian® has been used as exterior cladding for the futuristic OVO Wroclaw centre (Wroclaw, Poland) and is found also in a variety of interiors at the high-end DoubleTree by Hilton Hotel located inside the centre. Design by Gottesman-Szmelcman Architecture, www@gsarch.org. Photo by Kamil Czaja. The plot where the OVO Wroclaw stands wasn’t easy to design. There is an existing post office made of bricks on one side and major thoroughfares on the other two, which means a major car traffic and significant emissions. 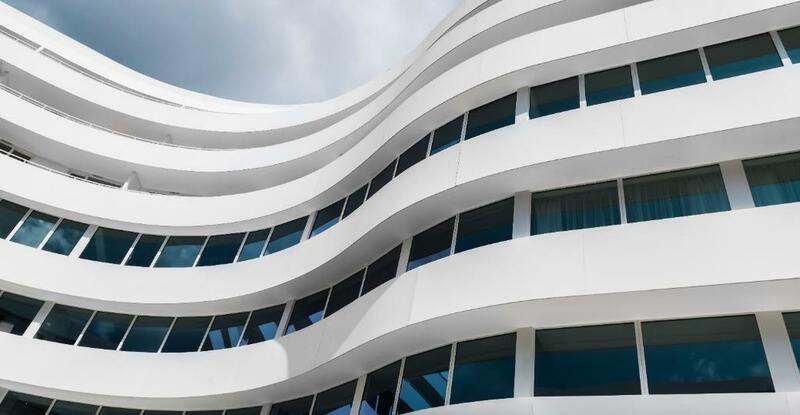 Thanks to the non-porous and easy to clean surface of DuPont™ Corian®, the façade will be pristine and beautiful over the long haul. Furthermore, if anything happens to the curves on the façade, it can be mended on site without having to dismantle it. OPEN-CLOSE: If the post office is a typical public building that is closed and underlines boundaries, we chose to envision an open building, one that is a part of the public space. OPEN-GREEN: we retained the boundaries of the urban block but we created an internal public garden. LIGHT-DARK: While the post office is dominated by the deep richness and detailing of red brick we opted to go with white Corian® and to underline the play of light and shade. An additional reason for choosing Corian® was our desire to align the way we work with 3D modelling and its translation into the built form. Corian® enabled us to retain the spirit of the design, its minimal lines and perfectly curved surfaces. SOFT-HARD EDGE: If the post office is a solid mass defined by hard edges, we sought to create a softer and more ambiguous contour to our building. The amorphous design that was envisioned required alternative building techniques in order to be properly realized. After considering various options, Gottesman-Szmelcman Architecture chose to clad OVO Wroclaw with panels made with DuPont™ Corian® high-tech surfacing material.